The 'Tanak' Reclaimed Wooden Wine Rack is a variation on the Lenak. 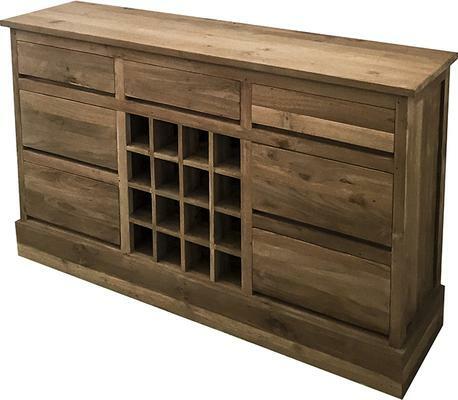 This reclaimed wooden wine rack and drawers will compliment any room in the house. 100% eco friendly and perfectly made from beautiful reclaimed teak. Available in custom sizes and designs too. The finish is smooth sanded, which is then glass rubbed at the factory to bring out the natural oils - the best and only way to finish reclaimed teak. This item is sold and dispatched directly by Ombak. Ombak offers the highest grade of stunning reclaimed teak furniture, showcasing a wide selection of beautiful items for every room in the home. Stunning dining tables, dining sets, coffee tables, sideboards, beds, TV units and much more. Ombak are a personal, ethical company working with recycled materials and a community workshop in rural Indonesia. Reclaimed Teak is previously used teak that comes from old Dutch colonial buildings in Indonesia. Modernisation in the far-eastern country has seen many of the old style wooden buildings replaced with brick and mortar. The original buildings were built more than 100 years ago from solid teak, and it is this wood that is recycled to make Ombaks products. Ombak offers incredible, ethical and beautiful reclaimed furniture.